Designation: Professor at University of Michigan Rogel Cancer Center. List of Author(s): Li Q, Wen L, Wicha M, Chang AE, Moon JJ. Copyright: © 2018 Li Q, et al. This is an open-access article distributed under the terms of the Creative Commons Attribution License, which permits unrestricted use, distribution, and reproduction in any medium, provided the original author and source are credited. Characterization of cancer stem cell (CSC) markers provides potential targets for CSC-direct therapy. However, the CSC phenotype varies substantially among patients. 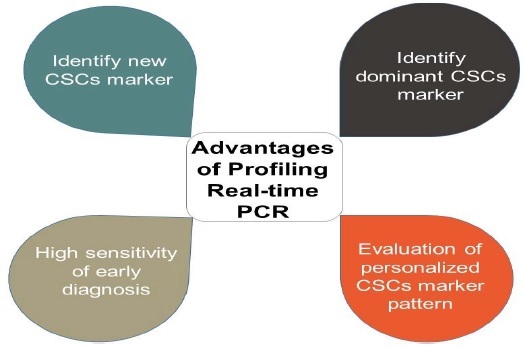 Therefore, fast and accurate identification of personalized CSC surface markers is critical determining the precision of CSC-specific targeting. Mid-to high-throughput profiling real-time PCR can simultaneously quantify the gene expression panel of hundreds of CSC surface markers and CSC specific activated signal pathway molecules with minimal samples. Through detecting CSC markers of circulating tumor cells, the PCR assay can lead to early diagnosis of tumors, evaluation of tumor treatment effects, and monitor of tumor recurrence. Cancer stem cells, Markers, Mid-to high- throughput profiling real-time PCR, Cancer immunotherapy. CSC: cancer stem cell, ALDH: aldehyde dehydrogenase, FCM: flow cytometry, IHC: immunohistochemistry, WB: western blot. Cancer stem cells have drowned fast attention as a small population of cancer cells that are responsible for tumor onset; resistance to radioand chemotherapies; cancer relapse; metastasis and evasion from host immune surveillance [1-3]. Cancer stem cells have been isolated and characterized from hematological and multiple solid tumors including cancers of the lungs, liver, pancreas, colon, brain, head-andneck, breast and, ovaries, gastric, as well as skin cancer melanoma [4-8]. To improve the current therapeutic efficacy of cancer, initial therapeutic treatments against a primary tumor require a focus on how to recognize and eliminate cancer stem cells to prevent the primary tumor from recurrence and metastasis, thus increasing the survival. To target cancer stem cells within the bulk of a tumor, identification of the surface markers of cancer stem cells is critical. In the last decade or so, certain distinct cancer stem cell markers have been identified (Table 1). Cancer stem cell marker expression can predict cancer prognosis and recurrence following conventional anti-tumor therapy, because cancer stem cell-related gene expression or protein signatures reflect the abundance and nature of cancer stem cells in patient tumor tissues, thus reflecting biology, behaver as well as the outcome of the tumor in response to therapy [9,10]. More importantly, characterization of cancer stem cell markers will provide potential target for cancer stem cell-direct therapy, particularly cancer stem cell-targeted cancer immunotherapy, as these cancer stem cell markers may serve as or be used as antigen/ immunogen to develop anti-cancer stem cell host immunity. Table 1: Cancer stem cell markers [1,2,9,10,31-33]. We identified and characterized cancer stem cellenriched populations in both human and animal cancers, using aldehyde dehydrogenase (ALDH) as a marker. High levels of aldehyde dehydrogenase (ALDHhigh) activity has been successfully used as a reliable single marker to isolate cancer stem cell-enriched populations in breast cancers and a variety of other human tumors, as well as in murine cancers [11-24]. High ALDH activity has been associated with development of metastasis, resistance to chemotherapies, and poor prognosis in human breast cancer [14,25-27]. We have shown that ALDHhigh identifies tumor initiating populations and demonstrated the antitumor efficacy of ALDHhigh cancer stem cell lysate-pulsed DC vaccines in tumor protection models as well as established tumors after radiation therapy [24,28]. We also examined head and neck squamous cell carcinomas (HNSCC) for the antigenicity/ immunogenicity of ALDHhigh HNSCC cancer stem cells vs. that of ALDHlow HNSCC non- cancer stem cells . Anti- PD-L1 significantly augmented the therapeutic efficacy of ALDHhigh HNSCC cancer stem cell vaccine in the adjuvant setting after tumor resection . Our previously reported methodology for generating cancer stem cell vaccines relies on isolating ALDHhigh cancer stem cells from bulk tumor. This limits the clinical application of this approach. To develop “off-the-shelf” cancer stem cell vaccines for cancer patients, identification and use of cancer stem cell antigenic markers in the form of peptides would be advantageous. Up to date, many ingenious approaches have been tested to target cancer stem cells for therapeutic purposes based on targeting cancer stem cell markers, including antibodies [34-36], CAR-T [37-40], CRISPR/Cas9 genome editing , nanoparticle-mediated strategies [42,43], and oncolytic viruses [2,44,45]. However, the cancer stem cell phenotype can vary substantially among patients who suffer from the same type of cancer . Cancer stem cell surface markers expressed on tumor cells of the same patient at different period or even in the same cancer tissue are heterogeneous . In this field, there is a huge demand for simultaneous, fast, accurate identification and recognition of cancer stem cell surface markers. Several approaches have been applied to identify and recognize stem cell marker expressions, such as flow cytometry (FCM), immunohistochemistry (IHC), western blot (WB), etc. Unfortunately, these methods are limited to monitoring the expression intensity and activation status of certain cancer stem cell markers. For cancer stem cell-specific targeting, there is an urgent demand for simultaneous, fast, and accurate identification method to recognize the cancer stem cell markers as well as downstream proteins and the amplification of the relevant genes. PCR is an effective tool for nucleic acid detection, and it has been widely used in both basic research and clinical diagnostics for tumor genetic analysis. While conventional multiplex PCR is potentially a feasible method to achieve this goal by using multiple pairs of primers designed to detect different genes, the reactions take place in reaction tubes, thus limiting the number of genes which can be tested with limited samples. To present a simple and efficient platform to overcome the drawbacks of conventional multiplex PCR, mid-to high- throughput profiling real-time PCR amplification can simultaneously quantify hundreds of gene expression with minimal samples, performed through gene signature plates. Gene signature plates are 96- or 384- well plates that are pre-configured with hundreds of PCR primers. The cross action and competition among different primers result in the uneven amplification efficiency of each target gene. Each plate contains pre-defined assays and endogenous controls dried-down in the wells, ready for accurate assessment of hundreds of gene signatures in one simple experiment. Therefore, due to its reliability, feasibility, highthroughput capacity, and simplicity, mid-to high-throughput profiling real-time PCR was used to quantify the gene expression levels of hundreds of cancer stem cell surface markers and cancer stem cell specific activated signal pathway molecules. 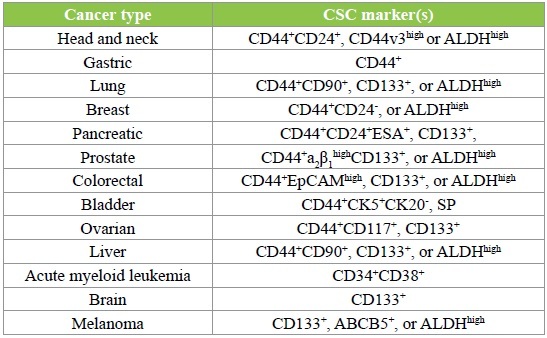 According to the expression panel of different cancer stem cell surface markers, the dominant cancer stem cell surface marker population can be selected. Therapy targeting mono-dominant cancer stem cell marker or multiple high expression markers could then become useful for personalized therapy. The amount of sample required for each mid-to highthroughput profiling real-time PCR assay is minimal, which is applicable for the testing of rare clinical and laboratory samples. For example, collecting circulating tumor cells and analyzing the stem cell phenotype of circulating tumor cells using mid-to high-throughput profiling real-time PCR can lead to early diagnosis of tumors; evaluation of tumor treatment effects; monitoring of tumor recurrence, and determination of the phenotype differences between residual or recurrent cancer stem cells and primary cancer stem cells. Together, these would provide valuable data for choosing individualized cancer stem cell markers for targeting. When mid-to high-throughput profiling real-time PCR is performed to detect cancer stem cell markers, different potential cancer stem cell populations can be collected based on the cancer stem cell markers detected. The ability of proliferation, invasion, tumorigenicity can be evaluated between different potential cancer stem cell populations. In this way, we can identify dominant cancer stem cell populations, which will be very valuable for personalized cancer stem cell-targeted therapy (Figure 1). Application aspects of mid-to high-throughput profiling real-time PCR assays. Figure 1: Application aspects of mid-to high-throughput profiling real-time PCR assays. In summary, mid-to high-throughput profiling real-time PCR assays may generate high-quality data for a broad range of studies, providing over millions of pre-designed primer/ probe sets for a specific biological process, covering multiple species. Due to its high-throughput capacity, reliability, versatile functions, and simplicity, mid-to high-throughput profiling real-time PCR applied for testing and identification of cancer stem cell markers and their biological activities is promising and may find valuable usages in both basic research and clinical studies. This work was supported in part by NIH grant R01 CA210273 and the Gillson Longenbaugh Foundation.